An area of forest more than half the size of Australia has been discovered, dotted across several continents. The amount discovered is equivalent to 60 per cent of the size of Australia and has increased the estimate of global forest coverage by 10 per cent. Researchers from the University of Adelaide are among the team led by the United Nations’ Food and Agriculture Organisation (FAO) to have uncovered the 467 hectares of previously unreported forests and woodlands. The forests have been identified in drylands in the Sahara desert, around the Mediterranean, southern Africa, central India, coastal Australia, western South America, north-east Brazil, northern Colombia and Venezuela and northern parts of Canada and Russia. They have previously been difficult to measure because the density of trees is low, making them hard to detect using satellite images and other technologies. A new photo-interpretation tool developed at the FAO, called Collect Earth, has overcome this challenge by offering a simple way to check the number and density of trees in arid areas. Researchers from 15 organisations have used the tool to analyse very high-resolution satellite images of more than 210,000 dryland monitoring sites, discovering the new forests and woodlands in the process. The amount discovered is equivalent to 60 per cent of the size of Australia and has increased the estimate of global forest coverage by 10 per cent. The Age of Exploration may be long past, but even in the 21st century, our maps can still get a major update. Using satellite imagery, a new study has found hidden forests all over the world—almost enough for a second Amazon — in areas with little moisture known as drylands. Past estimates of how much of the world’s drylands are covered in forests have run into lots of problems: For instance, the satellite images used to measure them are often so low-resolution that it’s hard to figure out the difference between a tree, a shadow, or even a patch of dirt. To correct for that, an international team of researchers performed the first global study using a new set of ultra–high-resolution Google Earth images—in which each pixel represents a patch of ground less than a meter wide, as opposed to tens of meters. Hundreds of scientists and students then combed through 210,000 images and found that the world’s drylands host 40% more forests than thought, the team writes today in Science. That’s more than a 9% bump in total global forest coverage, or two-thirds the size of the Amazon. A new study using high-definition satellite images has found 378 million additional hectares of forest around the globe—almost enough for a second Amazon. The study will help researchers figure out how best to conserve and restore these forested areas. It will also help scientists make more accurate estimates of how much carbon dioxide Earth’s trees are sucking out of the atmosphere—and how much of our fossil fuel emissions they’ll be able to handle in the future. 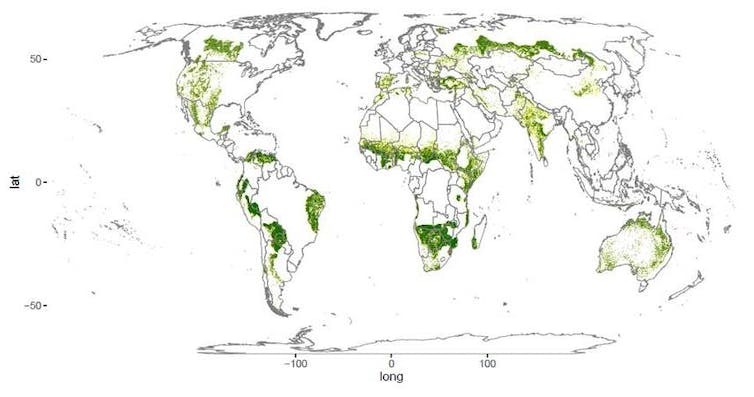 A new global analysis of the distribution of forests and woodlands has “found” 467 million hectares of previously unreported forest – an area equivalent to 60% of the size of Australia. The discovery increases the known amount of global forest cover by around 9%, and will significantly boost estimates of how much carbon is stored in plants worldwide. Reduction in government support coupled with the rise of Chinese competitors have lead to the collapse of Europe’s solar industry. 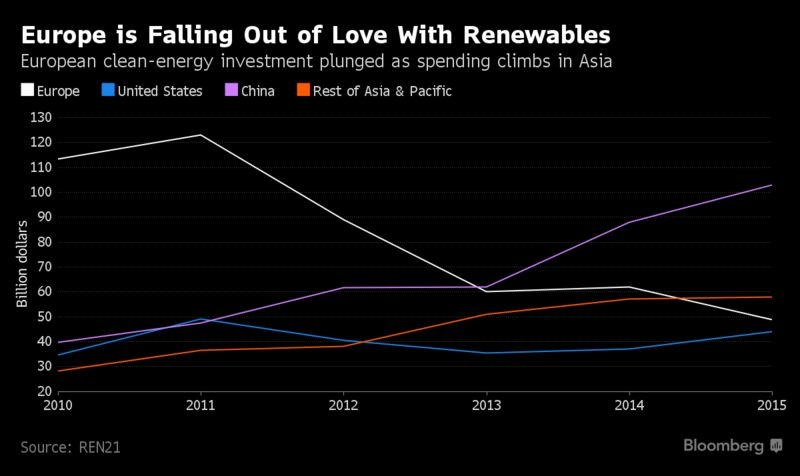 In recent times China has been giving Europe’s solar power industry a run for their money. They have since driven Solarworld, a German-based company to insolvency and further reduced the overall profits of SMA solar, the world’s largest maker of solar inverters feeding solar power to various electricity networks. This stern competition saw shares in Solarworld drop by about 8% on Thursday alone, leaving the company to issue a statement saying that they would now need to file for insolvency. Chief executive officer, Frank Asbeck also issued a further statement acknowledging the poor step forward, not just for Solarworld but also the solar industry as a whole in Germany . Regardless of the massive government subsidies that aided Europe in building their well-known global solar industry, even industry giants like SMA solar reported a drastic drop in their first quarter profits by about 90 %. Overtime, the reduction in government support has led to a decline in the industries reproducibility and this coupled with the rise in Chinese competitors like Jinkosolar, Trina solar and Canadian solon have further contributed to the decline in their popular European counterparts like q-cells, Conergy and solon . While Europe had hoped that cutting costs would help them once again gain momentum, they were wrong as China has continued to grow, now becoming the world’s largest market for solar products, having encouraged leading local firms to increasingly supply other regions with products. This has not only resulted in cheaper prices but also affected Europe further . SMA solar has since commented on this, stating that China has raced to the forefront due their intensive pricing policies, their attempts to tap into foreign markets and their abilities to overcome and compensate any form of shortcomings in the sales and services sector. SMA solar further said that they hoped to expand their energy management businesses in march in the hopes that the market would then show higher entry barriers for their Chinese competitors . In addition to statements issues by SMA solar, the popular German wind turbine maker, Nordex also issued a statement saying that its intake of orders in the first quarter had also dropped drastically by about 40%. Spiegel here calls it “the end of an era”. Once ballyhooed as the technology of the future bearing the promise of economic revival in East Germany, solar equipment manufacturing has crumbled and gone the way of dinosaurs, all in a matter of a decade. So rapidly can economic evolution send subsidized industries into extinction. Germany’s last remaining major solar manufacturer, Bonn-based Solarworld, led by a flamboyant Frank Asbeck, has officially declared it will file for insolvency after 6 years of red ink (operating results). The announcement was made Wednesday. Thousands of workers who banked their futures on solar jobs now face uncertain futures. Solarworld’s demise is the last in a spectacular series of solar manufacturer bankruptcies that swept across Germany over the past years, with names like Solon, Solar Millenium and Q-Cells going under. According to Finanzen.net here, Solarworld had over 3000 employees on the payroll at the end of 2016. In the early 2000s leaders and green energy proponents promised to turn parts of former communist East Germany into a “Solar Valley” that would boast secure, high paying hightech jobs. Today it’s a solar rustbelt with a ruined landscape of shattered visions and dreams. Spiegel calls it a “valley of tears”. Solarworld was viewed as the German solar industry’s leader, and its director Asbeck was called the “sun king” and even had solar panels installed on the Vatican and met Pope Benedict XVI personally. Asbeck, one of the co-founders of the German Green Party and an avid owner of a 300 hp Maserati, blames the company’s woes mainly on cheap imports from China and legal battles in the USA, reports WirtschaftsWoche. Arctic nations have renewed calls for the world to address climate warming, but U.S. Secretary of State Rex Tillerson says the United States will not rush to make a decision on its policies. Mr. Tillerson spoke Thursday in Fairbanks, Alaska, at a meeting of the Arctic Council, an advisory group made up of the eight Arctic nations and indigenous groups. The council adopted a nine-page “Fairbanks Declaration 2017,” which noted that the Arctic is warming at more than twice the rate of the global average. The document noted the importance of reducing soot and methane emissions and said climate change is the most serious threat to Arctic biodiversity. Mr. Tillerson signed the document. But in opening remarks, he cautioned that the U.S. is reviewing several important policies, including how the Trump administration will approach the issue of climate change. The Arctic Council, he said, will continue to be an important platform as the Trump administration deliberates. President Donald Trump has said little about Arctic policy, but he has taken steps to put U.S. Arctic Ocean waters back in play for petroleum drilling. The Arctic Council’s goals are sustainable development and environmental protection of the Arctic. The council does not make policy or allocate resources, and its decisions must be unanimous. 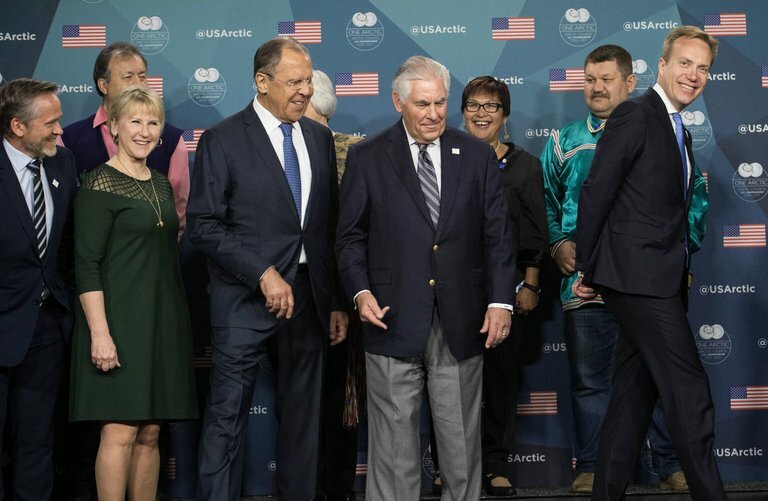 The U.S., an Arctic country because of the state of Alaska, is joined on the council by Canada, Russia, Denmark, Finland, Iceland, Norway and Sweden. Swedish Minister of Foreign Affairs Margot Wallstrom said she walked away from a private conversation with Mr. Tillerson hopeful of the U.S.’s intent in the region. The worst-case scenario feared by some would be that Mr. Tillerson used this gathering to announce the U.S. would withdraw from the Paris Agreement. The U.S. chaired the council for the last two years. The U.S. highlighted three areas during its two-year chairmanship — improved living conditions and economies for those living in the Arctic, stewardship of the Arctic Ocean and climate change. President Trump is expected as soon as next week to order the Environmental Protection Agency to rescind its Clean Power rule that is blocked by the courts. But the President faces another test of political fortitude on whether to withdraw the U.S. from the Paris climate accord. That’s suddenly uncertain. Mr. Trump promised to withdraw during the presidential campaign, correctly arguing that the accord gave “foreign bureaucrats control over how much energy we use.” His transition team even explored strategies for short-cutting the cumbersome, four-year process of getting out of the deal. But the President’s is now getting resistance from his daughter, Ivanka, and Secretary of State Rex Tillerson, who are fretting about the diplomatic ramifications. No doubt many countries would object, and loudly, but this risk pales compared to the potential damage from staying in the accord. President Obama committed as part of Paris to cutting U.S. emissions by 26% compared with 2005 levels by 2025. Even Mr. Obama’s climate regulatory programs—all imposed without Congressional votes—would only achieve about half that commitment. Mr. Trump is killing those Obama programs, which means the U.S. may not reach that Paris promise. Why stay in an agreement that the Trump Administration has no interest or plan for honoring? Another risk is that the U.S. might at some point be coerced into compliance. Mr. Obama joined the accord without congressional assent and endorsed the lengthy withdrawal process precisely to bind future Administrations to his climate priorities. Since Mr. Trump’s election, the international climate lobbies have debated ways to muscle the new Administration to comply. These include imposing punitive tariffs on U.S. goods or requiring the U.S. to hit targets in return for other international cooperation. Mr. Tillerson might consider that Paris will be used as leverage against him in future international negotiations. Lawyers and domestic environmental groups are also exploring how to use lawsuits to enforce the deal. Greens are adept at finding judges to require environmental regulations that Congress never intended. Such sympathetic judges today pack the D.C. Circuit Court of Appeals and include Supreme Court Justice Anthony Kennedy, who in 2007 joined four liberals to redefine the Clean Air Act to cover carbon as a pollutant. Remaining in the Paris pact will invite litigation to impose the Paris standards and direct the EPA to impose drastic carbon cuts that would hurt the economy. Energy companies are aware of this threat, and despite Exxon ’s recent pledge to pour $20 billion into Gulf Coast facilities, other companies remain wary of U.S. regulation. They will be warier if Mr. Trump looks like he’s waffling on his climate positions. Mr. Trump’s best bet is to exit the United Nations Framework Convention on Climate Change, which could be done in a year and would result in a simultaneous withdrawal from Paris. That would quickly end the litigation risk. Mr. Tillerson said at his confirmation hearing that he believes the U.S. should remain in the Paris pact to have a “seat at the table” for the climate debate. But the U.S. doesn’t need Paris to have a say in global energy policy. America has already done more to reduce CO2 emissions with its natural-gas fracking revolution than has most of the world. Many of the Paris signers want to use the pact to diminish any U.S. fossil-fuel production. Mr. Tillerson will also be on the back foot in Paris discussions as he tries to overcome his past as an oil company executive. The best U.S. insurance against the risks of climate change is to revive economic growth that will drive energy innovation and create the wealth to cope with any future damage—if that day arrives. Policy details aside, the worst part of Mr. Obama’s climate agenda was its lack of democratic consent. He failed to persuade either a Republican or Democratic Congress to pass his regulation and taxes. So he attempted to impose that agenda at home through the EPA and abroad via Paris to use international pressure against domestic political resistance.